The world’s leading software development tool comes together with the global leader in remote access and collaboration to enable development teams to plan, track, and release great software faster. 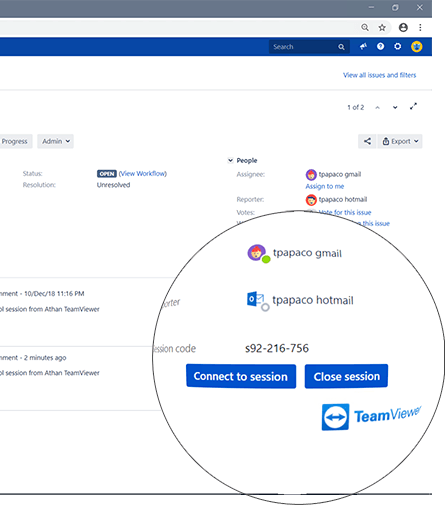 With the TeamViewer integration to JIRA, users can seamlessly collaborate with other stakeholders from within the JIRA ticket to solve issues or perform tasks faster. See who is online in TeamViewer, and connect to them with a single click. Share your screen, chat, have a meeting, or remotely access devices to collaborate efficiently and solve issues faster. Create and share invites to sessions with one click if the other party is offline.